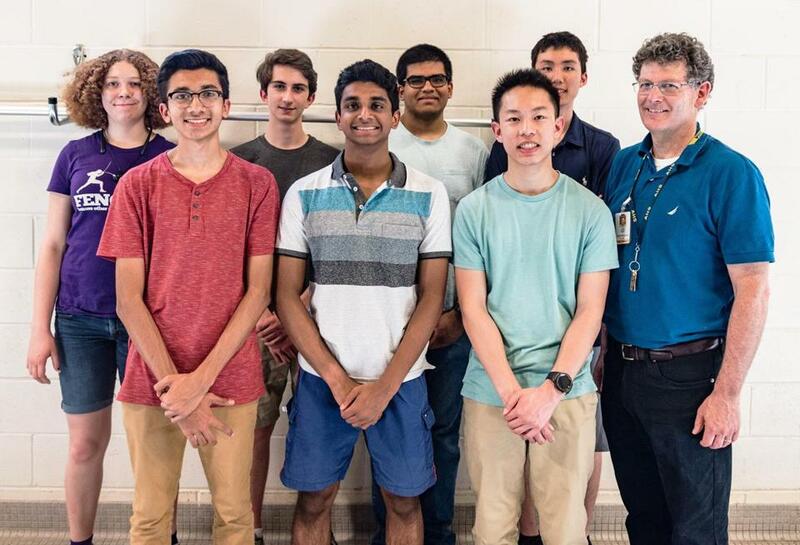 Members of the Andover High team include (front row from left) Nalin Sinha, George Joseph (volunteer lifeguard), Alex Zeng, and coach Dan Donovan; (back row) Sara Earl, Sam Garth, Omkar Savkur, and Curtis Lee. After blowing away the competition at a regional underwater robot challenge, 10 students from Andover High School will participate in the international competition at UMass Dartmouth on Saturday, June 2. The SeaPerch Challenge is an underwater robotics competition where students are provided with a kit of basic supplies such as PVC pipe and small direct current motors and charged with designing a remotely operated underwater vehicle (ROV) to complete two challenges. In the first, students must guide the ROV through an obstacle course that includes hoops. In the second, they must use the same ROV to transfer objects from one platform to another. The Andover High team placed second out of 50 teams at a regional competition held at the University of New Hampshire on April 13, said Dan Donovan, a physics teacher at Andover High School who heads the team. Donovan, previously a Navy nuclear engineer on the USS Long Beach, started the SeaPerch team at Andover High last year. He is also co-advisor of the school’s science team and thought the competition sounded like something students would like. “The scale of the project is not too big so it is overwhelming for the students but it really helps them learn a wide variety of skills,” he said. The team has been tweaking its design since the regional competition. While Andover High does not have a pool, Raytheon, a US defense contractor headquartered in Waltham that sponsors the SeaPerch Challenge, has helped to arrange pool time elsewhere. “I certainly have a lot of affection for this particular program and want to thank Dan and teachers like him that show that extra level of dedication and commitment to the science field,” said Paul Ferraro, vice president of Seapower Capability Systems at Raytheon Integrated Defense Systems. The team will face off against 170 other groups from the US, Canada, New Zealand, and Australia at UMass Dartmouth. 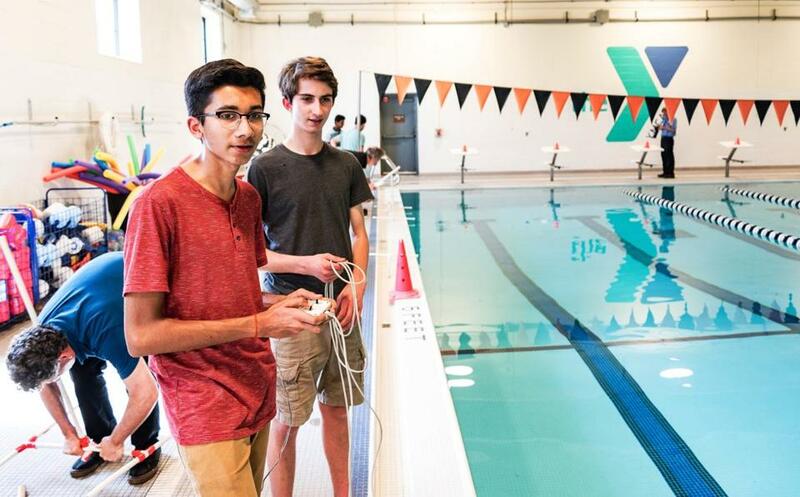 Nalin Sinha and Sam Garth test Andover’s remotely operated underwater vehicle.